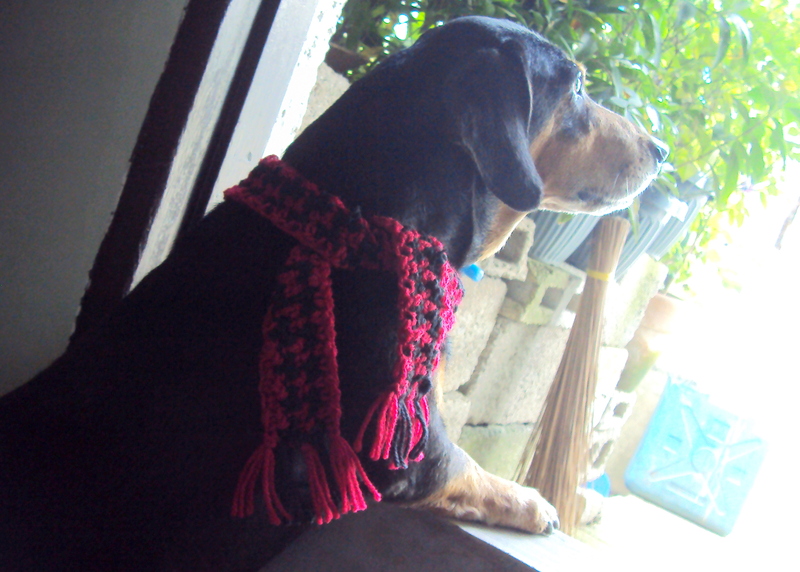 Make a scarf for your pet! 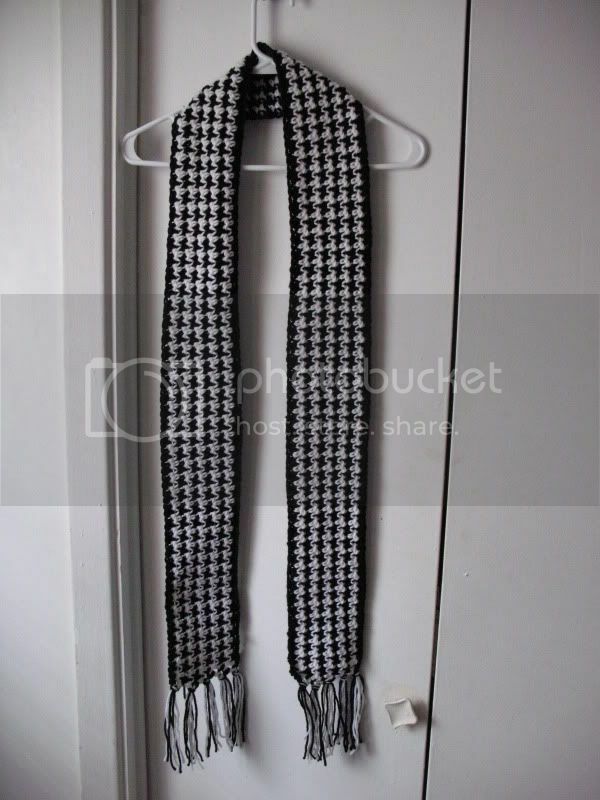 A houndstooth scarf, to be more appropriate and stylishly classy. If your pet has any sort of fashion sense, they will surely love this! Changing up the length and width of this scarf is extremely easy, too–you can even make it for yourself, to match with your pet. And more surprisingly, you don’t need to learn a new stitch or finishing technique. The houndstooth pattern is made by alternating dc and sc stitches (yes, it really is that simple!). Row 5: Ch 1, sc in first dc, (dc in next sc, sc in next dc) across: 41 sc and 40 dc, finish off. For each row end, cut three pieces of the same color yarn measuring about 4″ each. Fold all three in half together. Insert hook around post of row end, pull folded end of yarn through, and pull out all the ends through the loop. I hope you (and your pets) like this! If you need any help, just leave a comment below. 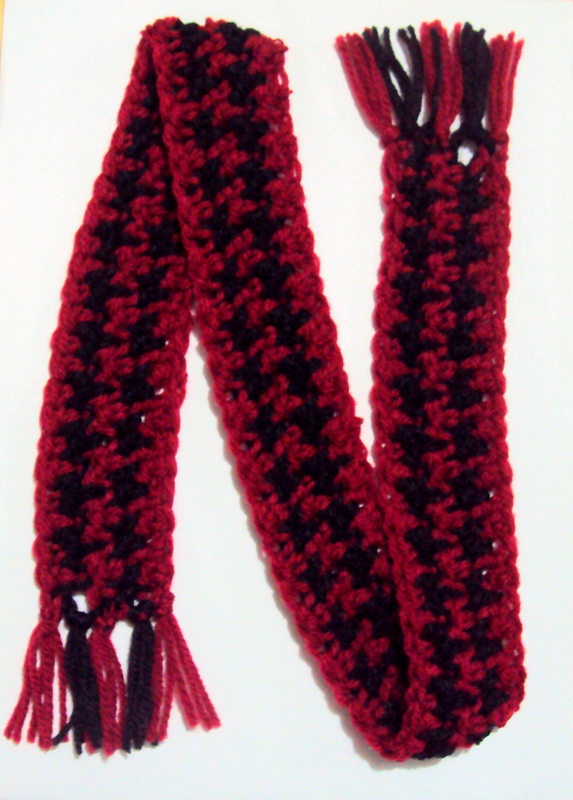 This entry was posted on Wednesday, December 29th, 2010 at 11:53 AM by Claire Ortega-Reyes	and is filed under Free Crochet Patterns. You can follow any responses to this entry through the RSS 2.0 feed. You can leave a response, or trackback from your own site. I looooove hoodstooth! I’m going to have to play around with this pattern 🙂 Thanks! Hey Bananas, sorry to hear about that. I kind of giggled while reading your comment, though. 🙂 Reminds me of when I struggled out of the plethora of bows in my hair as a kid. Hey Elisabeth, glad to see you like it! 😀 Hope I can get to see what you come up with it. Hello Nita! It all depends on how much chains you make for the foundation–you should make more to make it “human-sized.” Just make sure that it’s a multiple of 3, plus 1 for the turning chain. Follow the rest of the pattern and it should work out all right. 🙂 Good luck with your project! when you say multiple of 3 what do you mean exactly? like when chaining make sure 3 goes into the number then add one for turning? I just want to make sure before i start it, sorry to bother with such a basic question! it’s appreciated though! Raelynna, yes, you are correct! A multiple of 3 would be…3, 6, 9, 12, 15, etc.. so any number that 3 divides into without a remainder. Yours is cute. Mine doesn’t look anything like it. LOL. Are you turning at the end of the rows or just starting back at the beginning of the previous row? I didn’t turn at the end of the rows, since every row calls for a color change. I sort of pulled up the color left from two rows below, in order to continue work. You can also cut off the yarn at the end of each row; start over with a new strand for each row–wouldn’t show up much if you’ll be adding fringe to the ends anyway. Just make sure that you alternate colors per row, and that you make sc stitches into dc’s, and the dc stitches into the sc’s from the previous row. I hope your project works out fine! So, this isn’t back and forth? I would need to stop at the end of each row and begin again at the start of each row? Hi Lorraine! Wowowowow! (Or should it be Bowowow, haha) Absolutely smashing work, although your lovable Raider does steal the scene in the photos! Lovely granddaughter, too. 🙂 I love the colors you used. Claire, I love this design. Thank you for sharing it. I don’t know if you’ve heard the story about Patrick “The Miracle Dog” in New Jersey, but I’m working on one of these scarves today in his honor. I’d send it to him when I finish it, but he’s already being bombarded with gifts. So, instead, I’ll be donating it to a local shelter. With your permission, I’d like to make a few to give to folks in exchange for them making a monetary donation to an animal rescue organization. Hello Tadd! That sounds great, it would be an honor if you use my pattern. Good luck and happy crocheting! You are awesome!! I looked for several days, trying to find a houndstooth scarf pattern for Christmas presents this year. Not only did your pattern work, but I was able to build on the dimensions for a “human sized” scarf. Great job and very much appreciated!! I’m a little confused. Since you don’t turn at the end of each row are you starting at the beginning on each row? Never mind, I figured it out! I can’t wait to see the finished scarf. Thanks so much for this pattern. Wonderful pattern! Have you tried adapting it for a hat? I have family members that are Alabama Tide fans, and they would love something like this as a hat! In fact, Christie. I am going to buy some yarn this weekend and try this very thing. Christie, my hats have turned out wonderfully. Hi there, I thought this was a great idea but I ran into a bit of trouble when i got to the third row. How do you single crochet into a double crochet and double crochet into a single crochet? Hi Ruth, you would make the stitches like you normally would. You’d insert your hook into the top loops of the stitch (doesn’t matter if it’s a single crochet or a double crochet stitch, they both look the same from the top so you would do the same thing) and make the stitch as usual. Let me know if you need more help. I was so excited to learn how to make the houndstooth stitch. Being from Alabama and having many friends who are Bama fans, I have already crocheted several scarves and hats for adults. I made a hat for my grandson and my college roommate’s daughter and have had 4 of their friends want me to crochet them a hat. Black/white houndstooth is the signature of former coach Bear Bryant so is is very popular. I do intend to use that stitch in a jacket I am planning to make for myself. I love it. Thanks for sharing. As a novice at crocheting, I am trying to make the houndstooth dog scarf. I don’t understand when you say you don’t turn the piece. How do you crochet back? Also, the directions say in Row 2 to chain 3, what do you do with that when the next direction says to sc in nect dc, and dc in next sc? Hi Martha, you do turn (I guess it depends how you look at it) try reading Claire’s reply about turning in the previous comments. For the chaining, you’ll start with the chain 3, then do the sc in next dc, dc in next sc, etc. You don’t do anything with the chain 3, the chain is just there so that the beginning of the row is the same height as the rest of the row. So you’re not going to work into it or anything. thanks so much! great pattern in black and white too! I’m an Auburn girl myself but my husbands die~hard Bama. he wants a hat in crimson with the Bama A on the front, the one thats a little curvy? i cant find a pattern anywhere for that darned A lol. I’ve tried wingin it and comin up with my own and its soooooo not workin. any chance you’d know where i could find a pattern for it? Can you just stitch it on with yarn, like cross stitch? I made a baby carseat blanket using Alabama’s colors, red and white, in the houndstooth pattern. I would like to send you a picture but not sure how to do that. I am working on accessories for pictures of dogs in our local shelter. I’ll run up a few of these for the photographers to use. Thanks!